We love photos like these, where we are standing at the threshold of amazing Bar Mitzvah decor, waiting to experience Los Angeles event design at its best. This club-like lounge set-up seems to beckon guests to the dance floor, with its cool textured pink lighting in the entrance leading into an almost icy modern blue vibe that brings to mind the word "chill." It must be such a thrill for a 13-year-old for to see his name up on that screen as he makes his grand entrance into the party through these doors. 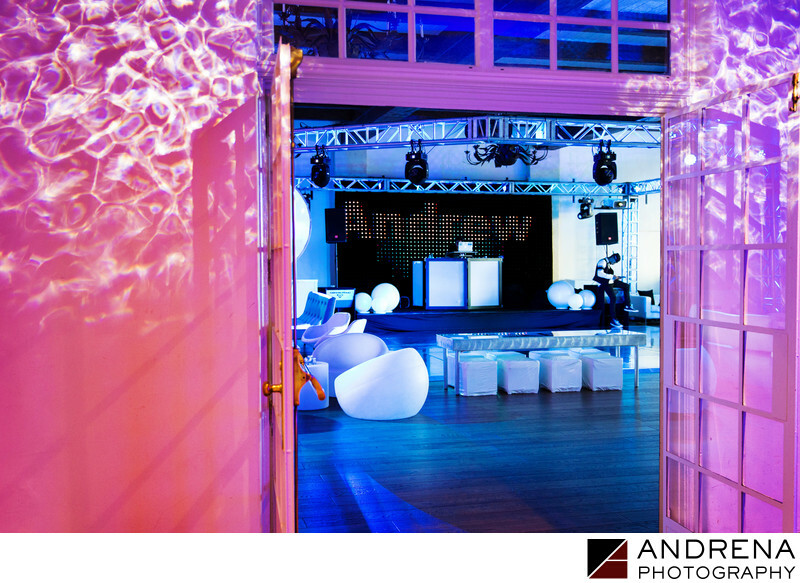 We loved the projected water decoration shown on the hallway walls at this country club. Before all the dance party excitement begins, we always strive to capture a "calm before the storm" photograph of the amazing details from the point of view of how the first guests would see them as they trickle in from cocktail hour.